Panoramic views from the terrace! 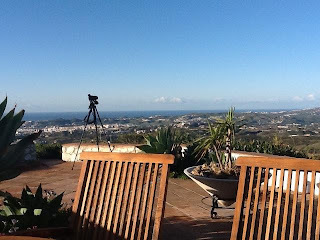 We arrived at Dave's villa in Mijas after a 4 hour drive from Torrevieja in the early evening of Monday. I'd forgotten what a stunningly beautiful location this is, with panoramic views of the town of Fuengirola below, the Mediterranean shimmering to the south with Africa in the distance, along with high Sierra's to the north, you run out of superlatives to describe the place. It's a birders paradise and I find myself spending hours just sitting on the patio watching the passing groups of birds in the clear blue sky: Red-rumped Swallow, which take respite on the phone wires in the early morning, Common Swift along with odd Pallid and always hopeful of an elusive Alpine. Small pockets of Bee-eaters occasionally pass by and a couple of skittish Sardinian Warblers have provided a small challenge in trying to obtain a decent image. Peregrine, Kestrel, the occasional Little Egret but strangely none of the larger raptors such as Booted or Short-toed Eagle, plentiful on my last visit in April. Butterflies, moths, geckos and lizards are another grateful distraction, with Swallowtail and Spanish Festoon butterflies plentiful, beautiful moths such as Crimson Speckled Footman in the evenings and the most intriguing of visitors, Wild Boar! Dave has had several visitations recently and while sitting out enjoying our first evening we were alerted to snorting and munching from below the wall. At least two of these nocturnal beasts were almost among us, just managing to pick out the faintest of shadows in the moonlight as one shot by, closest I've ever, or wanted to be!